There's been quite a bit excitement here at That's What She Said in regard to pampering one's Valentine. I hope all my readers were pampered beyond compare a few weeks ago! Now that the flowers have wilted or the warm glow from a special night out has faded, it is so important to continue the pampering. We deserve it, don't we! And therein lies the challenge... how to keep the flame burning. the Scandle Massage Oil Candle! The Scandle Body Massage Candle is a fragrant hand-poured body massage candle that, when burned, melts to create a healthy body massage oil that can be used to enhance the healthy of your skin. Not only, is The Scandle Body Massage Candle healthy for your skin, but it is also healthy for the environment...emitting less soot and toxins into the environment than parrafin candles. Most graciously, I was given an opportunity to test the Scandle Shimmering Body Candle, in Sugar Kisses. Hmmmm - simply delightful! Made of a unique combination of both soy wax and lotion, including all the benefits of soy while eliminating the 'heaviness' of pure soy wax alternatives, Scandle leaves your skin hydrated and glowing! This was my first experience with a massage candle and, although a bit hesitant at first, my husband and I found our Scandle massages enchanting. The candle burns at only two degrees above body temperature, certainly not too hot, but warm enough to be sooth and relax. The scent was divine and you can be assured that our Scandle massage candle will get used often! Beyond the physical benefits of a luxurious, aromatic massage, the Scandle Candle offerings are home spa products that you can feel good about indulging in! Scandle, a member of PETA's Caring Consumer program, offers products that contain 100% natural ingredients, vegan friendly and cruelty free! 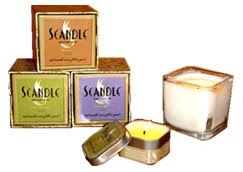 Scandle offers eco-friendly refillable ceramic cannisters, Scandle candles in a wide variety of enchanting scents, as well as other home spa products, such as the Scandle Sea Salt Soak & Scrub. Purchase your own Scandle Massage Candle to keep the pampering going from the Scandle Candle online store! Leave a comment letting me know your thoughts on Scandle Massage Candles or which scent Scandle offers that entices you the most for 5 bonus entries in any active giveaway on That's What She Said. Just leave a comment here with your thoughts or favorite scent, then enter 5 bonus entries in any giveaway with the phrase "Scandle Bonus"! I was provided with a Scandle Shimmering Travel Candle to explore for the purposes of creating this review. The opinions expressed above are both honest and my own. Information and images taken from various Scandle sites.